In Scooby-Doo! And the Gourmet Ghost, the Mystery Inc. gang visits Rocky Harbor Culinary Resort, a new cooking retreat located in New Port Cove, Rhode Island. It’s a food lover’s destination, where visitors can learn to prepare meals like master chefs. As Scooby-Doo and his pals arrive to the resort, they are met by Fred’s uncle Bobby, who happens to be the world-famous chef and restauranteur Bobby Flay. Scooby-Doo! Mystery Incorporated, “The Devouring” — Dr. Rick Spartan returns to Crystal Cove to stop a gluttonous monster who is devouring people whole. We have some DVDs to giveaway. To be eligible to win a copy of Scooby Doo! 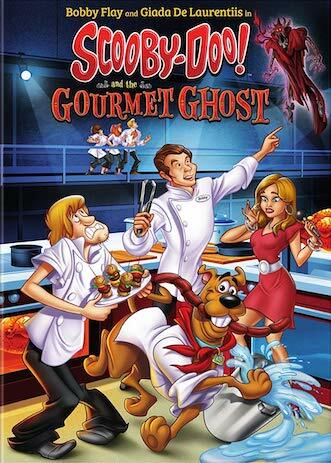 And the Gourmet Ghost, email us at [email protected] with “Scooby Doo Giveaway” in the title. Please supply your name, address, phone number and email address (so we can let you know if you are a winner). The deadline for this giveaway is September 7, 2018.